With horses, as you all know, there are so many variables in our efforts to achieve our goals. One of my goals had been to find a product that was nutritionally sound and would provide all that my horse needed to be healthy and sound BUT one that I could adjust to suit the ever changing variables of pasture, season, stress (competitions, travel, paddock changes etc), work load, and a red head Alpha mare! I originally took Essy on as a 5yr old, on free lease. The idea was to work her up and train her for a young girl who wasn't quite ready for her at the time. She was on a very basic diet with no supplements at the time. In the first year I fed her a complete horse feed but could see that it didn't offer me the flexibility to adjust vitamin/mineral levels according to need. Her hooves were quite bad, her coat a little dull, she sometimes lacked energy. This is when I found out about the Gotcha Equine Plan. After starting this her hooves improved (the farrier was happy) she had a lovely shine to her coat with a thick tail and a continually growing mane and calm energy. Although she has never been a tense type of horse, she is always more relaxed when on the Gotcha Plan. 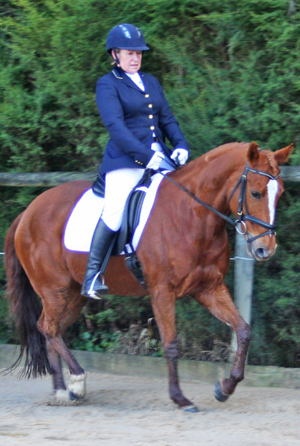 Two years into our free lease and I was enjoying competing and having success (2nd in TTT Dressage Jackpot) so I offered to purchase her and the rest is history. 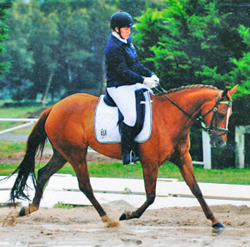 Leo’s Cover Girl (aka Essy) has been on the Gotcha Equine Plan for approximately 5 years now, and definitely noticed a further improvement with the new Australian Made products and more palatable. Essy is and has always been on grass 24/7. At this time of year with no rain and no growth it is easy to maintain a balance. In Autumn (especially if it has been wet) and Spring (with rapid grass growth) I play a game of keeping one step ahead and adjusting Essy’s Magnesium to suit and adding Toxin Binder if necessary. Over the years, with help from Lucy at Gotcha equine, I have learnt to read the signs, before it gets too exciting! I did take her off all the vitamins and minerals one Spring, as she was having no hard feed at all. She did not become a raving mad woman (mare), but she was quite forward and a bit tense!! Currently she is on a well eaten out paddock while there is a high fire danger, and will be rotated onto fresh pasture shortly. She receives only one feed a day of ½ cup speedi beet and 1 scoop of chaff, plus her vitamins and minerals and iodised salt. 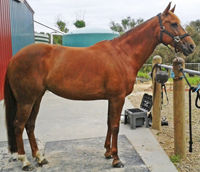 Her coat is shiny, she is well weighted and is worked a minimum of 5 days a week plus competitions, clinic and rallies. We need to have our horses happy and healthy and “balanced” from a feeding point of view and this must go hand in hand with correct, consistent training as well. If we can influence as many “variables” as possible, then it helps consolidate our training and partnerships so that most times we “get it right” ! !